Paying Post. This review is a new program that I follow, starts from searching on google I finally meet with the new review system Payingpost. I also review the program and this is a kind of new things for me. 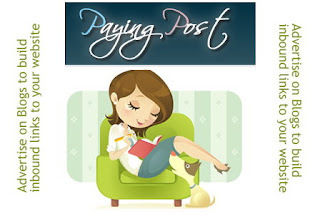 We can be a advertising and blogs too so In payingpost we get in to help advertisers promote their products or services. To follow this program is easy, just register with payingpost in the register member, we can enter a maximum of 10 blogs to get a job review. But we need to be patient because we will be reviewing by admin to agree to participate in this program. Once approved by the blog we're in for an install script as jobs. We may review a maximum of 3 jobs per day to review each blog. When our blog is ready and approved for review in our lives find jobs that match our blog. There will appear in a few jobs that exist and the distinction based on color jobs which we can review. For those who are to conduct a review of this program is interesting because it made it easier for advertisers and bloggers. For the program itself is quite interesting, where the products they will promote the many bloggers and of course they will get the backlink that can useful in Search engine optimized. btw trick dari mas alvien boleh tu, saya coba. tapi gimana caranya mengetahui jobs itu ada? mas Deni apa sudah pernah dapet dollarnya? @itik,,, aku baru dapet dua ini,, lom ada waktu banyak ol untuk cari jobs..
Hemmm... initinya dibayar tiap kita posting ya...? atau gimana...?